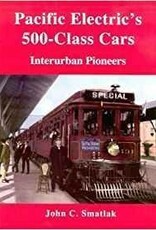 This new book from author John Smatlak tells the complete story of Pacific Electric s pioneering 500-class Red Cars , PE s first new interurban cars. 108 pages illustrated with over 120 photographs, many never before published. B&W with color covers. Pacific Electric was the world s largest interurban electric railway system, blanketing the Los Angeles region with more than 1,000 miles of rail lines. The 500-class cars were the company s first new interurbans, purchased beginning in 1901. The Fives opened many of PE s early interurban routes and served the system into the 1930s. 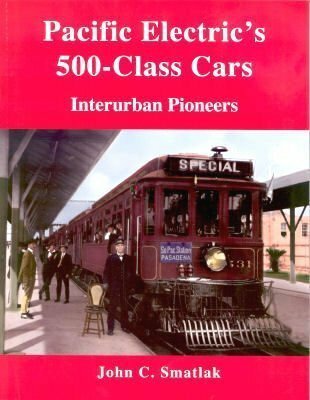 The book tells the complete story of this pioneering class of Red Cars from their beginnings at the turn of the century, through preservation and restoration in the 2000s. The story of the two full-size operating replica 500s built in 2003 for the Port of Los Angeles is also included. An exhaustive selection of photographs, drawings and historical documents have been assembled to tell this fascinating story, providing coverage that will please a wide variety of readers.